We're doing a baby craft-a-long! Join in at anytime, it is casual! Michele has finished-finished her Red Heart Team Spirit Tyson hat. The yarn softened up a lot with washing. Michele ripped out the Cascade baby sweater she was making and is using the Red Heart with Love in a baby blanket, the Crocheted Starburst Baby Blanket by Sara Rivka. Jill is working on the Baby Surprise Jacket by Elizabeth Zimmerman in Schoppel-Wolle Zauberball Starke 6 in the Olivenstrasse colorway. 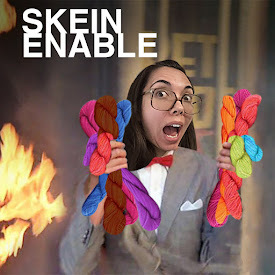 She spun a bit on her Malabrigo Nube. Michele likes the Circle-T Top by Shannon Mullett-Bowlsby from the Malabrigo website. She also likes the Laxo hat by Laura Nelkin. Jill has queued some shawls: the Evanthe shawl by Corrina Ferguson and the Red Rock Canyon shawl by Romi Hill. She finally got some MadelineTosh Tosh Lace in Oceana to make the Amille shawl by Emily Ross. She also bought a couple kits from Willow Yarns (Herrschners!). One is the Off-the-Grid Stranded Cowl by Alastair Post-Quinn (not on Ravelry!) and the other is the Tartan Mitts and Cowl by Rae Blackledge,which are chevron striped mitts and cowls in two long color repeating yarns. This American Life: Too Soon?